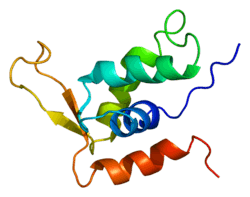 Forkhead box protein K2 is a protein that in humans is encoded by the FOXK2 gene. ↑ Durand DB, Shaw JP, Bush MR, Replogle RE, Belagaje R, Crabtree GR (Jul 1988). "Characterization of antigen receptor response elements within the interleukin-2 enhancer". Mol Cell Biol. 8 (4): 1715–24. PMC 363332 . PMID 3260003. 1 2 "Entrez Gene: FOXK2 forkhead box K2". Li C, Lusis AJ, Sparkes R, et al. (1992). "Characterization and chromosomal mapping of the gene encoding the cellular DNA binding protein ILF.". Genomics. 13 (3): 665–71. doi:10.1016/0888-7543(92)90139-J. PMID 1339390. Li C, Lai CF, Sigman DS, Gaynor RB (1991). "Cloning of a cellular factor, interleukin binding factor, that binds to NFAT-like motifs in the human immunodeficiency virus long terminal repeat.". Proc. Natl. Acad. Sci. U.S.A. 88 (17): 7739–43. doi:10.1073/pnas.88.17.7739. PMC 52378 . PMID 1909027. Nirula A, Moore DJ, Gaynor RB (1997). "Constitutive binding of the transcription factor interleukin-2 (IL-2) enhancer binding factor to the IL-2 promoter.". J. Biol. Chem. 272 (12): 7736–45. doi:10.1074/jbc.272.12.7736. PMID 9065434. Liu PP, Chen YC, Li C, et al. (2003). "Solution structure of the DNA-binding domain of interleukin enhancer binding factor 1 (FOXK1a).". Proteins. 49 (4): 543–53. doi:10.1002/prot.10227. PMID 12402362. Zody MC, Garber M, Adams DJ, et al. (2006). "DNA sequence of human chromosome 17 and analysis of rearrangement in the human lineage.". Nature. 440 (7087): 1045–9. doi:10.1038/nature04689. PMC 2610434 . PMID 16625196.